Because of you, our community is connected. 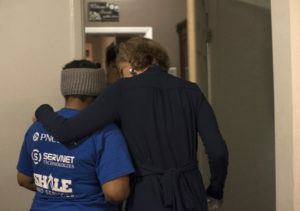 A resident at Ward Home in East Liberty receives comfort. While the Covestro Center for Community Engagement officially celebrated launching with our new name on October 4, 2018, you’ve been engaging with each other for years. Through BoardsWork!, 802 of you from 158 different companies have solved urgent community challenges and made values-driven decisions for partner nonprofits. By participating in SkillShare, 251 individuals from 14 purpose-led businesses have created real change through team solutions like logistics, HR competency mapping, and data analysis. Our community is connected. Since 2011, 362 different businesses, nonprofit organizations, and municipalities have built bridges here in our Pittsburgh home and nationally. Because of you, 231 unique organizations have completed 361 projects that have changed the landscape of the people and places you so deeply care about. Thank you for your commitment to the missions that matter. 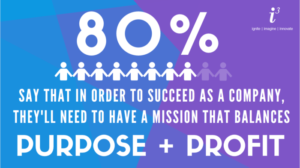 In a new survey, Fortune 1000 CEOs say employees are the top drivers in the push for their companies to have social purpose. Lanier Robertson, vice president, Human Resources, Covestro LLC, discusses the impact that demand is having on Human Resources. 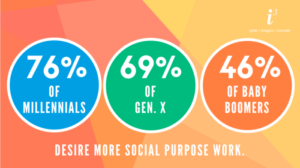 All generations are seeking work that makes an impact.